This website exists on computers at Weebly. 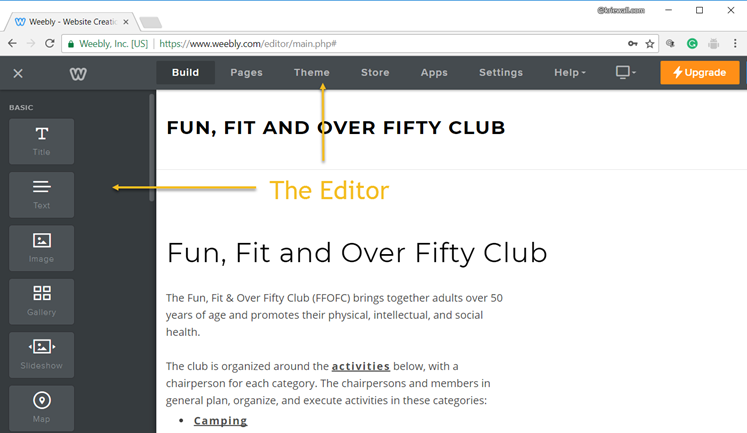 An easy-to-use editor is included to allow anyone to make changes to the website. This document describes how to complete common admin tasks. Links to Weebly's official documentation are provided for those who want to dig a bit deeper. No technical experience is required, but familiarity with some Weebly vocabulary is helpful. Changes to the website are made using the Editor. This is the software program used to upload photos, create galleries, and add captions. Each of the Admin Tasks below describes how to use the Editor to make site changes. ​Content Elements are the essential building blocks of your site. Nearly all the content you add to your pages will be built with elements. Examples of elements include text, images, galleries, and maps. To add a photo gallery, you will drag-and-drop elements to your activity pages. Pro Tip: See the Weebly docs for an Intro to Content Elements. Move a Photo Gallery: Oops! I put that on the wrong page. Let's move it!